Approval has been given for a 299MW biomass plant application on the former Anglesey Alumninium site at Holyhead by the UK Department for Energy and Climate Change. With the biomass plant go-ahead there is a potential for 700 jobs to be created on the island, around 600 during the build phase and then 100 over the plant's operating lifetime. This is very welcome news for the island community where unemployment rates are among the highest in the country, following the closure of key industry over the last 2 years or so, including operations at Angelsey Aluminium Metals and Eatons in Holyhead. The board of Anglesey Aluminium Metals, a joint venture between Kaiser Chemical Corp Inc. and Rio Tinto, has announced its preferred bidder, from a shortlist of three, for its former smelter site in Holyhead. With the approval for the biomass plant, earmarked for one part of the AAM site, there is speculation as to whether the new owner will make use of the energy plant licence. 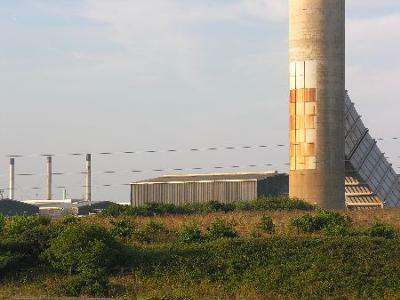 One possibility is that an industrial site could be built on the former smelter works, and the adjacent biomass plant could be its power supply. could power well over 250,000 homes. Significantly, after a rigorous assessment process by Environment Agency Wales, the former smelter site at Holyhead has secured an environmental permit for operation as a biomass plant. Looking at the bigger picture, should the new site owner decide to proceed with the biomass plant, this will help contribute to a balanced energy policy for the UK, a policy introduced by the previous Labour government and now continued by the present government. Assuming the biomass plant goes ahead, building is expected to start sometime in 2013 and would take around 24 months to completion. Feedstock for the plant would be sourced mainly from the bi-products of the North American timber process, mainly branches and roots from stripped timber,and then delivered by special vessels across the Atlantic to the jetty in Holyhead outer harbour. The aim would be, over the medium term, to encourage procurement of locally harvested wood from short rotation coppice and other fast growing trees. Local politicians are supportive of the plans to create these jobs from the biomass project at Holyhead, as well as the potential from tourism at the Penrhos Nature Reserve as proposed by Land and Lakes. For more news and articles, subscribe to our free Anglesey News here. It's as easy as 1-2-3! Frankenstein is right guys there is no need to be panic about the Biomass plant. They good for the country. They will emit any harmful gas or smoke. It is good source for energy. The best way to utilize the natural waste into useful energy. the establishment of the biomass plant is very nice idea. because it increases the job opportunity and the energy resource. this establishment cannot cause any harm to the public. if the stack has filter it is completely safe. good about the jobs, just hope theres not too much polution from the chimney!